Disclosure: I have received payment for this post on Food Gifts You Can Make at Home and the text and photograph have been provided to me. This post is in line with my blogging policy. Now is a great time to make food gifts that you can give as Christmas presents. As the growing season comes to an end there is plenty of fruit and vegetables that you simply have too much of. Old fashioned cooking has been making a big return and one of the harvest time cooking tasks of old was to make preserves. With the resurgence of old fashioned cooking has come the desire to grow your own fruit and vegetables. Allotments have also seen a big come back and the varieties that you might find on today’s allotments may have changed a bit. While some people still grow the traditional potatoes, carrots, onions, cabbage and beans (and there’s still a place for these) you might also find more exotic vegetables like yams or okra. Of course, it’s personal choice what you grow – it all depends on the food you like to eat. Inevitably there will sometimes be a glut. Runner beans have done exceptionally well this year and you can usually find some being sold at a very reasonable price outside the allotments. What to do with all this Produce? Without doubt, anyone who has grown runner beans this year has just about had their fill of them. Modern technology means we can freeze down a lot of our produce to use throughout the year. But there’s no fun in that and you can’t give a bag of frozen beans as a present at Christmas! 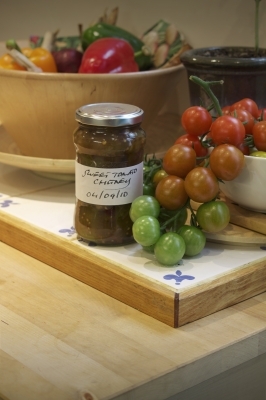 How about making jars of runner bean chutney? This is sure to be a gift that thrills your friends and family and it’s not the sort of thing that you can readily find in the shops. Make a selection of chutneys and jams and you can put them together to make a charming gift that has extra meaning because it’s home-made. Not everyone has access to allotments or has the ability or desire to grow their own vegetables. You can buy fruit and vegetables when they are in season so that you can make your own jams or chutneys but you may not have the time to do it. All is not lost as there are a number of purveyors of luxury food gifts that have done the job for you. It doesn’t matter if you use your own produce or buy speciality produce to make up your own gift. As they always say, it’s the thought that counts so make sure your gift will be special to the person it’s intended for. I make all kinds of food gifts for Christmas and love it! I like canning things but also make cookies, breads, glazed nuts, etc. I think I want to make your honey nougat for gifts! I love giving homemade food gifts! Great post. I nearly always make my own Xmas gifts and everyone really appreciates them – even the younger family members. I like receiving and giving food gifts. I don’t have much time for canning, but I usually make homemade truffles or cookies as a host gift. Hi Tandy, runner bean chutney is such a brilliant idea, looks like my beans have already taken off since we have been back in Phoenix. Thanks! I love food gifts. They sure beat out picture frames, candles and soaps in odd scents for sure!